Two more Monroe High School student-athletes made their college commitments in a ceremony held on Thursday, May 11, 2017 at Monroe High School. 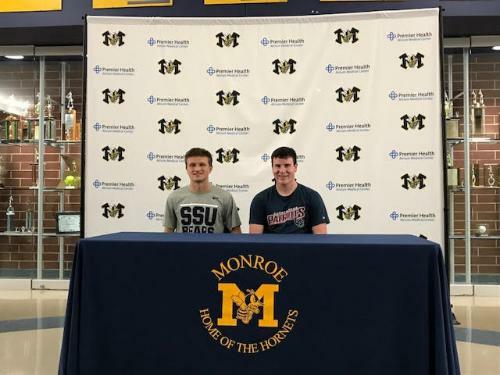 In front of family and friends, Seniors Nick Amaya (Football) and Thryceton Deckartd (Cross Country and Track & Field) made their intentions known to continue their academic and athletic careers at the collegiate level. Nick Amaya has committed to continue his football career at the University of the Cumberlands in Williamsburg, Kentucky. Thryceton Deckard has committed to continue his running career at Shawnee State University in Portsmouth, Ohio. Nick and Thryceton bring the the total number of student athletes from the class of 2017 that have committed to continue their academic and athletic careers at the collegiate level to 15. Congratulations to Nick Amaya and Thryceton Deckard!